Eating delicious, nourishing food that you love is an essential ingredient in a happy life—which is why dining at Aravilla is unprecedented in its quality, presentation and service. Professional chefs plan and prepare meals using the freshest ingredients, which are served in beautifully appointed, intimate dining rooms with tasteful linens, dishes and flatware. Most menus are inspired by the Mediterranean diet, known as the healthiest diet in the world, with minimal sodium to optimize heart and brain health. What’s more, the chefs are always standing by to accommodate special dietary requirements and requests including American staples and down home comfort favorites. Want something more casual? 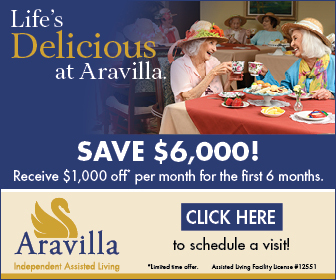 In our assisted living communities, you can opt for a drink, meal or snack in one of our themed restaurants or outdoor dining areas. Join your friends in the sports pub for a beer and a game, or have a barbecue overlooking the pool. Dine al fresco on the terrace, or listen to a few tunes in the piano bar with a drink and companion. You can even chat over fresh-brewed beverages and sweet treats in the promenade coffee shop. Our dining variety will always satisfy your appetite not just for food, but also for friends and fun.